Modding is possible, albeit rather difficult. Co-operative "Onslaught" mode DLC not available for PC version. 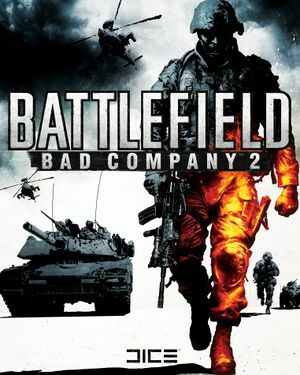 The Battlefield series on Battlelog - PC section. 9.1 "Some AA alternatives might not come up for some users"
9.2 "Loadouts Lost, Switching between Bad Company 2 (BC2) & Vietnam Multiplayer (MP)." 10.2 "A connection error occurred. If this happen during account creation press cancel and then login with your new account"
10.3 "Unable to log in. Please try again." Either disc check or online activation with SecuROM DRM, unknown machine limit. A De-Authorization Tool is available. Can be converted into DRM-free using the latest patch. Patch R11 updates the retail release to the latest version. Not required for digital editions. Delete or rename ea_logo_hd.res and dolbydigital.res. Frame rate cap to 200 FPS. No refresh rate cap. 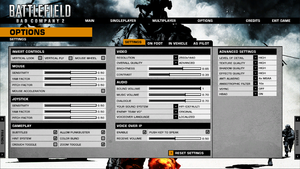 Use Widescreen Fixer or BC2 Cinematic Tools. May apply to single-player only. Change Fov=55 to the FOV you want and save your changes. On some systems, you might need to force DirectX 9 compatibility in order for the FOV to change. Planned for a future version of Project Rome. Use Helix Mod for better 3D support. "Some AA alternatives might not come up for some users"
CSAA and some MSAA alternatives might be hidden for some users. "Loadouts Lost, Switching between Bad Company 2 (BC2) & Vietnam Multiplayer (MP)." BC2 MP and Vietnam MP read the same parameters for class loadouts. The ensuring disparity of weapons results in loadout reset. SPECACT DLC adds four classes (SPECACT Assault, Engineer, Medic & Recon) to BC2 MP, absent from Vietnam. 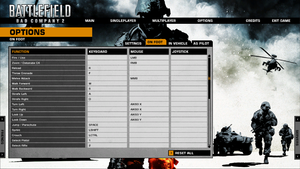 Use SPECACT classes exclusively for BC2 MP. By leaving the default classes alone in BC2 MP, the Vietnam MP loadouts are preserved. "A connection error occurred. If this happen during account creation press cancel and then login with your new account"
"Unable to log in. Please try again." If you're not seeing any multiplayer servers deselect all filters except for PunkBuster and click search. 9, 10, 11 Automatically set to the highest version the GPU can support. For details on how to manually set the DirectX version used, see Force DirectX Level. Although Frostbite is a relatively modding-unfriendly engine, a nascent modding community has formed and was able to extend the map border, create new in-game items and tweak weapons and vehicles. They have even released modding tools. Change DxVersion= to the preferred DirectX version (9, 10, 11). These options are not available in the in-game options menu. Change DxVersion=auto to either 9 or 10. Reduce RenderAheadLimit=2 to either 1 or 0. Reduce any other settings if necessary and save the changes. ↑ 1.0 1.1 File/folder structure within this directory reflects the path(s) listed for Windows and/or Steam game data (use Wine regedit to access Windows registry paths). Games with Steam Cloud support may store data in ~/.steam/steam/userdata/<user-id>/24960/ in addition to or instead of this directory. The app ID (24960) may differ in some cases. Treat backslashes as forward slashes. See the glossary page for details. This page was last edited on 1 April 2019, at 05:08.